NK-SHIPS is a free, internet-based online information service for the owners and operators of NK-classed vessels or vessels whose ISM/ISPS/MLC are registered with NK. 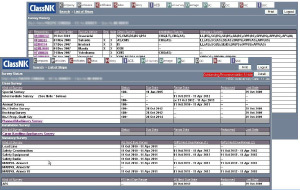 NK-SHIPS users can retrieve important information vital for ship maintenance and management, such as survey status for class and statutory survey items and due dates, and ISM/ISPS audit /MLC inspection status that assist in the maintenance and management of ships, 24 hours a day, from anywhere in the world via the internet. In addition, NK-SHIPS users can apply via the online web application service for surveys and audits /inspections linked with NK-SHIPS information. After registering as an NK-SHIPS user, information can be accessed by logging in through the web service portal. Please refer to the NK-SHIPS Brochure found below for more details. To register as an NK-SHIPS user, complete "Application for NK-SHIPS Internet Service", and send the application to the ClassNK Information Technology Dept. A mobile version of NK-SHIPS is available for NK-SHIPS users.